As the season changes to fall, things really get colorful all across America. The varied landscapes of the United States have made fall foliage drives a unique part of every year, with leaf peeping offering a colorful way to see this country from coast to coast. From vibrant reds and yellows to majestic purples across the mountains and valleys, blazing colors can be found easily just by getting behind the wheel and letting your eyes lead the way. Thanks to varied deciduous trees and landscapes, the country is blessed with a fall foliage palette that makes leaf peeping like driving through a Norman Rockwell painting. The science behind leaves changing colors each fall is relatively simple. According to the tree huggers at The United States Arboretum in Washington, DC, fall foliage starts across the country as the days begin to get shorter in late-summer and early-autumn. Of course, science aside, classic fall foliage drives draw thousands of leaf peepers to well-known (for good reason) hotspots like the Blue Ridge Parkway, the Adirondacks, the Berkshires, the Rockies, and California’s Eastern Sierras, but there are many other colorful drives to be enjoyed in almost every state. The nation’s national parks, preserves, and other protected areas can provide particularly powerful fall foliage experiences—and pictures—as can the National Scenic Byway and other state byway systems. Many states and even some specific destinations (like Asheville, North Carolina) now have updated information and dedicated pages on their visitor websites devoted to fall foliage. This makes it easy to find locations, drives, directions, and information about peak periods in each state. Often overlooked compared to the Blue Ridge Parkway below, Virginia’s Skyline Drive provides a shorter 105-mile fall foliage drive that is just as vibrant with mountain tree colors come fall. Like the Blue Ridge Parkway, the curving Skyline Drive features many overlooks and pull-offs that are perfect for leaf peeping. 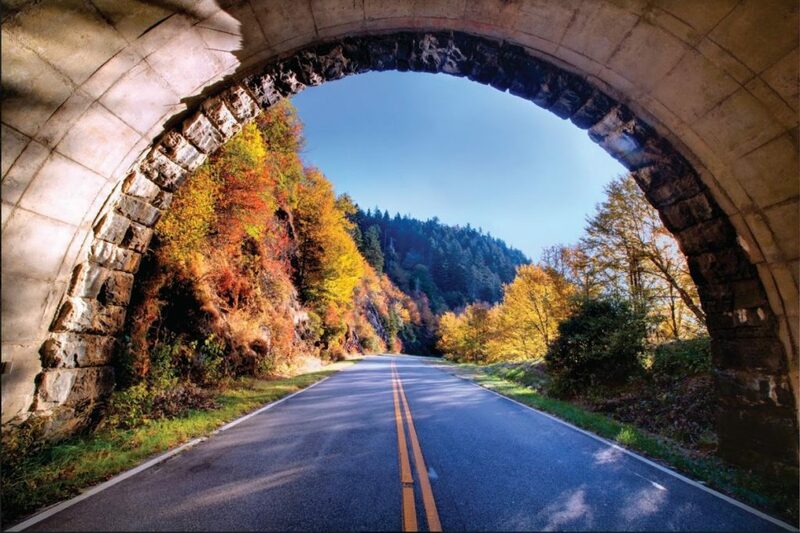 It starts in Front Royal and ends in Rockfish Gap, which is also the northern terminus of the Blue Ridge Parkway (making it easy to combine the two fall foliage drives for those with time). RVers should be aware that, also like the famed Parkway, there are several tunnels with height restrictions. There may be no more classic fall foliage drive in the United States than the 469-mile Blue Ridge Parkway through Virginia and North Carolina. With well-marked overlooks, easy-to-use mile markers, and varied camping and dining along the way that are either right on or near the Parkway, lower speed limits make this one of America’s easiest ways to get a full dose of fall colors in the mountains. The drive connects Shenandoah National Park with Great Smoky Mountains National Park, with possible classic stops including: pretty and historic Mabry Mill; Peaks of Otter (great dining with a view); Richard Balsam Overlook (which, at 6,053 feet, features views from the highest point on the Parkway); Moses H. Cone Memorial Park; and the mountain town of Asheville, which is near the Parkway’s Blue Ridge Parkway Visitor Center and the Folk Art Center. Leaf peeping by vehicle is much like being able to take your transportation of choice on a colorful trail with you. That’s certainly true of viewing fall foliage along the Roaring Fork Motor Nature Trail in the Tennessee portion of Great Smoky Mountains National Park. This paved 12-mile round-trip route out of bustling Gatlinburg transforms intrepid leaf peepers into a colorful primeval forest within minutes of leaving town. In addition to the beauty of colorful nature, there are also reminders of the area’s early settlers, including log cabins, gristmills, and other historic buildings. One of the best stops along this route is at Trillium Gap Trail for the short 30-minute hike to Grotto Falls, which are especially beautiful in the fall. The Tennessee Smokies trio of Gatlinburg, Pigeon Forge, and Sevierville can all serve as great bases for further exploration of majestic mountains foliage. There are several “Mohawk Trail” driving tours in Massachusetts that highlight the best of the Berkshires. The twenty-five miles or so roundtrip drive up to 3,491-foot Mount Greylock (the highest point in the state) and back provides a nice introduction, with the helpful Visitor Center, a steep meadow, and lots of views as leaf peepers gain elevation. Another drive of about sixty miles starts in Williamstown, home of Williams College, and includes Natural Bridge State Park, Savoy Mountain State Forest (head to Tannery Falls), and great views of Mount Greylock. The western edge of the Mohawk Trail highlights northern Berkshire County, with North Adams, Western Gateway Heritage State Park, and more. Other drives on and near the Mohawk Trail might include the colorful Hoosac Mountain Range, the Bear Swamp Project, Pioneer Valley, and more. Larger than the state of Vermont, the Adirondacks in New York State provide classic fall foliage of reds, yellows, and purples. With one of the longest fall foliage seasons in the northeast, the Adirondacks are crisscrossed by a dozen New York State Scenic Byways. Among many possibilities, one great option is to drive the 170-mile Olympic Trail from Lake Champlain to Lake Ontario through the High Peaks region of the Adirondack Park. The quaint village of Lake Placid was the home of the 1932 and 1980 Olympics, where nearby highlights can include Whiteface Mountain (site of many Olympic competitions) and abolitionist John Brown’s rustic farm. Adirondacks lake driving features lots of colors from sugar maples, yellow birches, American beeches, and more reflecting off the lakes in their fall glory. Designated a National Scenic Byway, New Hampshire’s White Mountains Trail encompasses spectacular fall scenery, covered bridges, historic sites, picturesque towns and villages, and friendly people over the course of its 100-mile route. The Trail is a loop tour that winds through sections of the 800,000-acre White Mountain National Forest and past many of the region’s most popular attractions. It can be driven in a day or can be the object of an entire vacation’s worth of relaxation, exploration, and discovery. The Northern and Southern Loops are fascinating routes to explore, affording a unique look at life in and around the White Mountains. Parts of the Trail have been used by travelers for centuries. In the early-19th century, the works of Nathaniel Hawthorne and landscape painter Thomas Cole, among others, drew attention to the White Mountains. Stretching from around quaint Calais down to the New Hampshire state line, the rugged Maine coast along Route 1 and other roads provide a perfect way to see coastal fall colors, including the Atlantic Ocean, lots of bays, rocky coastline, mountains, historic cottages, and more for backdrops. Highlights have to include: photogenic lighthouses; ‘lobstah’ and other fresh seafood; colorful Acadia National Park; and lots of historic and quaint coastal towns and cities like Camden, Bath, Freeport (and L.L. Bean), Portland, the Kennebunks, and York, which is America’s oldest chartered city. With spectacular fall foliage reflecting off Lake Michigan in five states, the 900-mile or so Lake Michigan Circle Tour was the mid-1980s brainchild of the Michigan Department of Transportation’s Jack Morgan. Though there are similar circle tours of other Great Lakes, Lake Michigan is the only one that lies entirely in the United States. Bisected by a “spur” route that connects Ludington, Michigan, and Manitowoc, Wisconsin, by ferry service on the SS Badger (providing a possible shortcut for the drive), there’s a Southern Lake Michigan Circle Tour (Ludington to Manitowoc or the reverse) and Northern Lake Michigan Circle Tour (Manitowoc to Ludington or reverse). 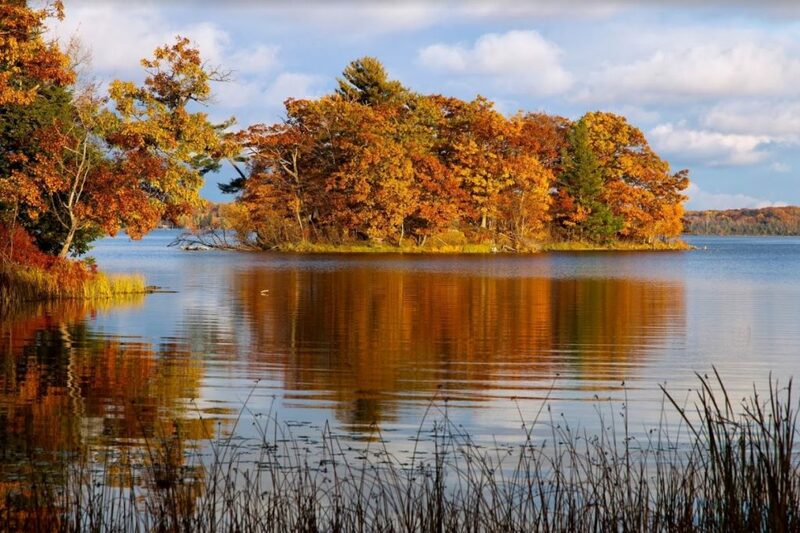 Beautiful beaches, varied towns and cities, and more await those searching for fall foliage in the Great Lakes region. Hamlin Lake in Autumn, Michigan. Photo by Craig Sterken Photography. While one wouldn’t normally think of Texas as being “colorful” come fall, the Lone Star State certainly has its share of fall foliage. Some of the best drives for leaf peeping in Texas are in the Panhandle region around Amarillo. The possibilities include Palo Duro Canyon State Park (where the cottonwoods turn a brilliant yellow); Route 287 south of Amarillo (especially from Claude to Memphis); and the Texas Fall Foliage Festival in and around Canadian, which is about one hundred miles northeast of Amarillo. Located along the Canadian River and the Texas Plains Trail, the small town of Canadian is leading the way in rural Texas tourism with events like their fall foliage festival, which is always the third weekend in October. The scenic Rocky Mountains in colorful Colorado are at their most brilliant in the fall. Aspens, especially, provide unique oranges, yellows, reds, and more to the vistas near and far. The 205-mile West Elk Loop Scenic & Historic Byway passes through three pretty mountain towns–Marble, Gunnison, and Crested Butte and is a classic Colorado fall foliage drive that showcases acres of aspens (the nation’s largest single grove). The marble for the Lincoln Memorial came from the old mining town of Marble. Gunnison offers a unique cultural mixture of ranching community meets university town, while Crested Butte is known as the “Wildflower Capital of Colorado.” Black Canyon in Gunnison National Park is a natural highlight of this drive as well. Driving Route 395 through the Eastern Sierras shows off some of California’s best fall foliage. According to John Poimiroo, editor of californiafallcolor.com, aspens begins showing flame red, orange, pink, and yellow in Bishop Creek Canyon at 10,000 feet (reachable by vehicle) in mid-September and peaks from the last week of September through the first couple of weeks of October. Then, it drops by elevation at a rate of about 500 to 1,000 feet per week, with spectacular leaf peeping throughout the canyon and at Convict Lake, Mammoth Lakes, June Lakes, Virginia Lakes, Lunday Lake, and the Walker River Valley. Poimiroo, who files regular fall foliage updates for the Eastern Sierras and elsewhere in California, says that means you can dependably enjoy fall color along this drive from mid- and late-September through October at various elevations along Route 395. What makes the colorful displays even more dramatic is that sawtooth, snow-flecked granite peaks rise dramatically above the color and it’s often reflected in the area’s tourmaline lakes. 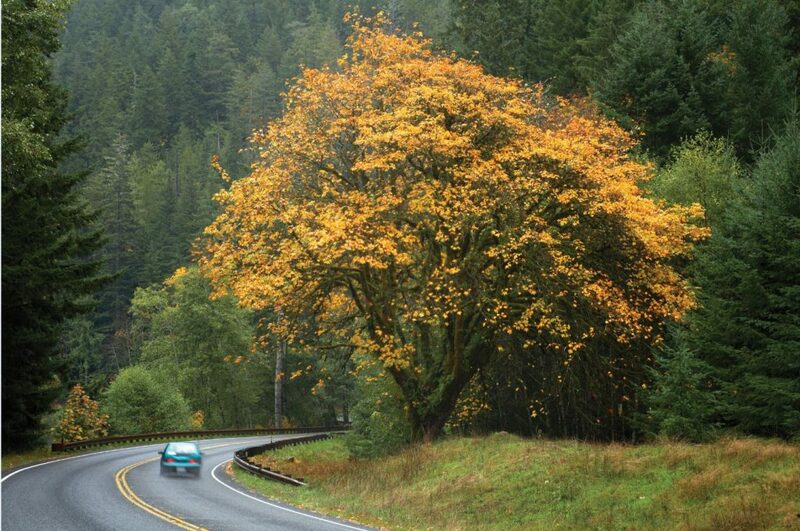 Washington State’s Olympic Peninsula along Route 1 is different from any other fall foliage drive in the country. Starting and ending in the Seattle area, the drive essentially circles the towering Olympic Mountains and sprawling Olympic National Park. Washington may be the Evergreen State, but there are still lots of fall colors to see on this drive. Highlights of the route might include the drive up to Hurricane Ridge for great mountain and fall color views; historic Port Townsend; pretty Lake Quinault, Lake Crescent, and other tree-lined lakes; Cape Flattery (look for tall mist-enshrouded Sitka spruces); and lots of coastal towns surrounded by colorful wilderness. Lake Crescent. Photo courtesy of Olympic Peninsula Visitor Bureau. The 127-mile Seward Highway is a National Scenic Byway for good reason. Running down the Kenai Peninsula out of Anchorage to Seward, the drive showcases Southcentral Alaska’s awe-inspiring scenic beauty, from dramatic mountain peaks and forests to alpine meadows and stunning fjords. Those lucky enough to be on the Seward Highway come fall will find fewer visitors and golden birch and alder trees against stunning views of Cook Inlet. Of course, there are many other fantastic fall foliage drives across the country and this diverse list is just a starting point for leaf peepers come fall. Some other colorful possibilities include the Ozarks in Missouri and Arkansas; Vermont’s Green Mountains; West Virginia’s New River Gorge National River; Wisconsin’s Driftless Region; and the Southwest’s unique Enchanted Circle Scenic Byway near Taos, New Mexico. 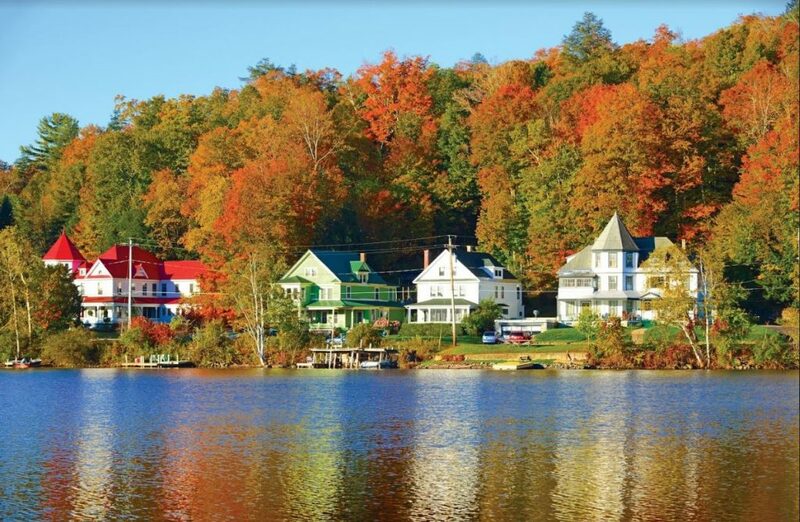 Naturally, America features many other locations where leaf-peeping drives are colorful rites of passage every fall. Learn more about autumn activities when you pick up your Sept/Oct 2018 issue of TrailBlazer Magazine! Feature photo: Skyline Drive. Photo by Cameron Davidson, courtesy of Virginia Tourism Corporation.